Here’s your chance to get into the Mexican spirit while you party with flamboyant colours in this fun and innovative video slot from Net Entertainment. This colourful video slot presented on 5 reels, four rows, and 40 fixed pay lines is based on the amazing tradition where you smash open a piñata to claim the treats inside. The bonus features included in this fascinating slot game include wilds, bonus symbols, free spins and a top paying jackpot bonus worth 300 times your stake. The background takes place in a dusty old town somewhere in Mexico where you can see several pedestrians and cars making their way to a party. In the distance, you will also find a big blue balloon in the shape of a fish that you wish you could smash open. There is a total of four high valued symbols known as the Animal Spinatas and consist of a donkey, a fish, a tropical bird and a bull shaped out of piñata material. The lower valued symbols are your usual playing card numbers ranging from 10 to Ace. All the symbols can appear colossal, meaning they can fully or partly be displayed on the reels in 3x3 or 2x2 blocks, assisting you towards far greater wins. Before you start running to your nearest piñata and grabbing anything that might smash it in half, first draw your attention to the variety of betting options at your disposal. You can decide between 10 different betting levels and seven different coin denomination choices with the minimum bet per pay line starting at £0.01 up to a maximum of £1.00. The minimum bet on a single spin starts at £0.20 while the maximum bet per spin is £200.00. The multi-coloured star piñata acts as the wild symbol and will only make an appearance during the bonus feature. There is also a colossal wild skull symbol that will only appear during the free spin feature. The wild star symbol will stand in for all other symbols except the bonus symbol. 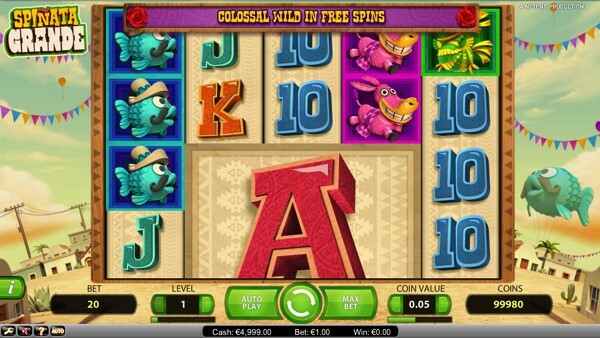 The classic slot machine wearing a big sombrero acts as the bonus symbol in the game. The slot machine bonus symbol will always be colossal and displaying part of it or the full symbol on the reels will activate the Mini-Slot game. Every bonus symbol in view on the reels will be spun individually and award you with free spins, a coin prize or extra spin. 3 free spins will activate 5 spins, and every Extra Spin will add more free spins. The coin awards are basically cash prizes. If you trigger the free spin feature, it will start instantly, and during the free spin feature, a colossal wild symbol will be added to the reels which will provide some amazing wins. Like most Net Entertainment video slots, Spinata Grande is enjoyable and very inventive. The quality of the sound effects and graphics are unreal, and the unique bonus feature will always leave you guessing on what surprise could be next. The video slot provides a low to medium volatility so you can expect frequent pay outs containing some decent wins. The Return to Player has been set to 96.84%, giving you a brilliant experience when spinning the reels of Spinata Grande. You can try playing Spinata Grande for free below in the embedded demo version of the game.